Procaps is a soil-encapsulating low moisture, low residue carpet cleaner with enhanced soil resistance and soil release for interim carpet maintenance cleaning. Procaps is formulated with superior soil release agents and advanced polymer technology to lift and encapsulate soil, spots and stains. 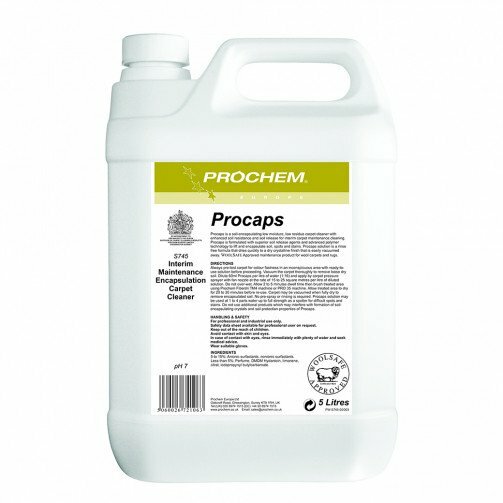 Procaps solution is a rinse free formula that dries quickly to a dry crystalline finish that is easily vacuumed away. WoolSafe approved maintenance product for wool carpets and rugs. For professional and industrial use only. Always pre-test carpet for colour fastness in an inconspicuous area with ready-to-use solution before proceeding. Vacuum the carpet thoroughly to remove loose dry soil. Mix 60ml Procaps per litre of water (1:16) and apply by carpet pressure sprayer with fan nozzle at the rate of 15 to 25 square metres per litre of diluted solution. Soil encapsulating spray cleaner for use with cylindrical brush machine. Procaps leaves carpet clean and dry in 20 minutes. Do not over-wet. Allow 2 to 5 minutes dwell time then brush treated area using Prochem Fiberdri TM4 machine or PRO 35 machine. Allow treated area to dry for 20 to 30 minutes before re-use. Carpet may be vacuumed when fully dry to remove encapsulated soil. No pre-spray or rinsing is required. Procaps solution may be used at 1 to 4 parts water up to full strength as a spotter for difficult spots and stains. Do not use additional products which may interfere with formation of soil encapsulating crystals and soil protection properties of Procaps. • Interim maintenance encapsulation carpet cleaner.